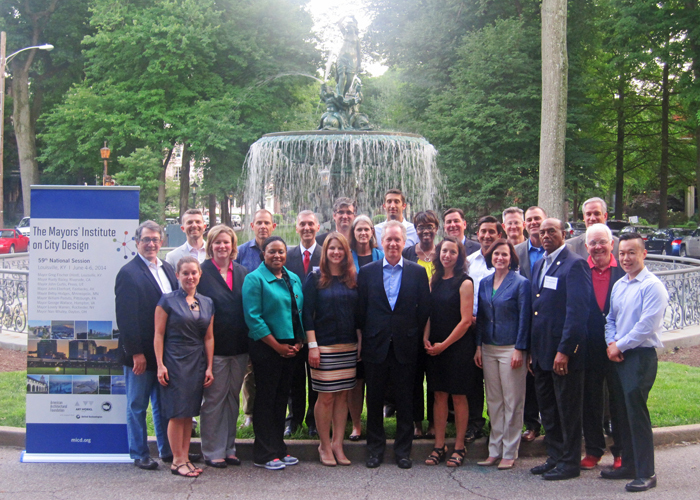 June 2014 – LOUISVILLE – The Mayors’ Institute on City Design was held in Louisville, KY from June 4-6 for its 59th National Session. Hosted by Mayor Greg Fischer and the City of Louisville, the event was attended by Mayor Rusty Bailey of Riverside, CA; Mayor John Curtis of Provo, UT; Mayor John Eberhart of Fairbanks, AK; Mayor Betsy Hodges of Minneapolis, MN; Mayor William Peduto of Pittsburgh, PA; Mayor George Wallace of Hampton, VA; Mayor Lovely Warren of Rochester, NY; and Mayor Nan Whaley of Dayton, OH. Experts in architecture, landscape architecture, urban planning, real estate development, transportation planning, community engagement, and urban design joined the mayors in the two-and-a-half-day discussions and offered pragmatic advice on how the mayors could approach the city design challenges facing each of their cities. The 59th National Session began with a bus tour of the City of Louisville led by Mayor Fischer. The tour showcased a number of significant sites and planning districts around the city, including the historic Churchill Downs, 4th Street Live, and several housing projects. Later that evening, the opening reception was held at the Fischer residence, overlooking the Waterfront Park and Ohio River. Mayor Fischer welcomed participants to the City of Louisville after remarks were made by the Mayors’ Institute on City Design Director Trinity Simons; National Endowment for the Arts Director of Design Programs Jason Schupbach; American Architectural Foundation President & CEO Ron Bogle; and the United States Conference of Mayors CEO & Executive Director Tom Cochran. Minneapolis Mayor Hodges initiated the design discussions the following morning, presenting on her city’s efforts to redevelop the Upper Harbor Terminal north of downtown. The city would like to create a vision and strategy for site rehabilitation to maximize redevelopment opportunities. The Resource Team offered suggestions on land use, design, and adaptive reuse of the site to maintain its industrial heritage and catalyze larger development opportunities while upholding the administration’s goal of social equity. Provo Mayor Curtis followed with a presentation on the proposed bus rapid transit (BRT) line that will connect a commuter rail station in Provo to the neighboring city. Central to this BRT system is the University Avenue corridor where transit can bring transformative changes by enhancing the street, creating amenities, and promoting economic development. The Resource Team encouraged the mayor to explore a variety of track alignment alternatives and street configurations for different BRT segments, adding community value and meeting specific needs of each localized planning area, as well as incorporating green infrastructure throughout the system. Rochester Mayor Warren presented on her city’s efforts to redevelop the southeast quadrant of Inner Loop Expressway that surrounds downtown. Beginning in 2014, this portion of the expressway will be closed, filled, and the land will be returned to the city. These “unlocked parcels” represent a tremendous opportunity for development, design and sustainable land use patterns. Emphasizing innovative, non-linear solutions for the project, the Resource Team gave guidance on how to fill the expressway trench and reconnect center city to the adjacent neighborhoods by breaking up the superblocks into smaller pieces and targeting development on each block. Pittsburgh Mayor Peduto concluded Thursday’s discussions with a presentation on the Pennsylvania Railroad Fruit Auction & Sales Building (Terminal Building) in the Strip District. The building is over a quarter of a mile long and is the spine of the neighborhood. Helping the mayor define the city’s role in this project and collaborate with the developer, the Resource Team laid out general development framework and regulatory policies that can help redevelop the site to its full potential. Fairbanks Mayor Eberhart commenced the discussions on the final day of the Institute by presenting on his city’s effort to revive downtown and prepare for a more robust tourism industry. Focusing on two key blocks with the highest commercial activities, the mayor discussed the challenges and opportunities in the study area. The Resource Team advised the mayor to redesign and reprogram the parking garage with temporary pop-up events to expand the public realm, strengthen main street, and manage parking for local businesses in the downtown core. Hampton Mayor Wallace followed with a presentation on a 19-acre site that sits next to the iconic Coliseum and the convention center. Currently a parking lot, the mayor would like to create a hotel district and promote Hampton as a regional destination for sports tourism. Highlighting the proximity of the study area to downtown, the Resource Team encouraged the mayor to seek partnerships regionally and build on the existing assets, particularly the creek and the new trails system, linking these amenities to the larger network of attractions around the city. Dayton Mayor Whaley followed with a presentation on a nine-block area at the heart of the central business district. Building on the momentum of the Greater Downtown Dayton and the success of a nearby Oregon Historic District, the city is looking to attract investment and change the public perception of downtown. The Resource Team identified opportunity parcels within the study area and advised the mayor to protect Dave Hall Park Plaza, program the Transportation Center parking garage with other uses, seek partnership with the university, and make this site a priority planning area of the city. Riverside Mayor Bailey concluded the Institute by presenting on his city’s efforts to bring back streetcar, using transit as a catalyst for economic development. The Resource Team offered suggestions on the proposed streetcar route, advising the mayor to split the track alignment into different typologies, engage the neighborhoods early in the planning process, and use this project to improve street infrastructure. Joining the mayors at this National Session was a distinguished group of Resource Team members: Fregonese Associates Principal Leila Aman; Metropolitan Research and Economics Principal David Bergman, AICP; Deborah Berke Partners Partner Deborah Berke, FAIA, LEED AP; J. Max Bond Center on Design for the Just City Director Toni Griffin; Jonathan Rose Companies Principal Daniel Hernandez; D.I.R.T. studio Principal David Hill, ASLA, LEED AP; Atlanta BeltLine President & CEO Paul Morris, FASLA; and University of South Florida School of Architecture and Community Design Adjunct Faculty Taryn Sabia, EdM., March, MUCD. The Mayors’ Institute on City Design is a National Endowment for the Arts leadership initiative in partnership with the American Architectural Foundation and the United States Conference of Mayors. The 59th National Session was sponsored in part by United Technologies Corporation. Since 1986, the Mayors’ Institute has helped transform communities through design by preparing mayors to be the chief urban designers of their cities. The Mayors’ Institute conducts several sessions each year. For a list of upcoming events, past attendees, or for more information, visit micd.org and follow @MICDdotORG on Twitter.